Just finished my first full day with our delegation to Bil’in – I think I speak for all our participants when I say we are honored and thrilled to be here. As I mentioned in my previous post, our group is made up of Chicago-area Jews and Palestinians, with one participant from Los Angeles. We are longtime friends and fellow activists for a just peace in Palestine and we organized this trip to show solidarity with the Palestinian nonviolence resistance movement on the West Bank. While individual members of the delegation have different personal opinions on the politics of the Israeli/Palestinian conflict and might differ on how a solution should politically be achieved, we are united in the conviction that full equality and civil rights should be enjoyed by all the people – Jews and Palestinians alike. 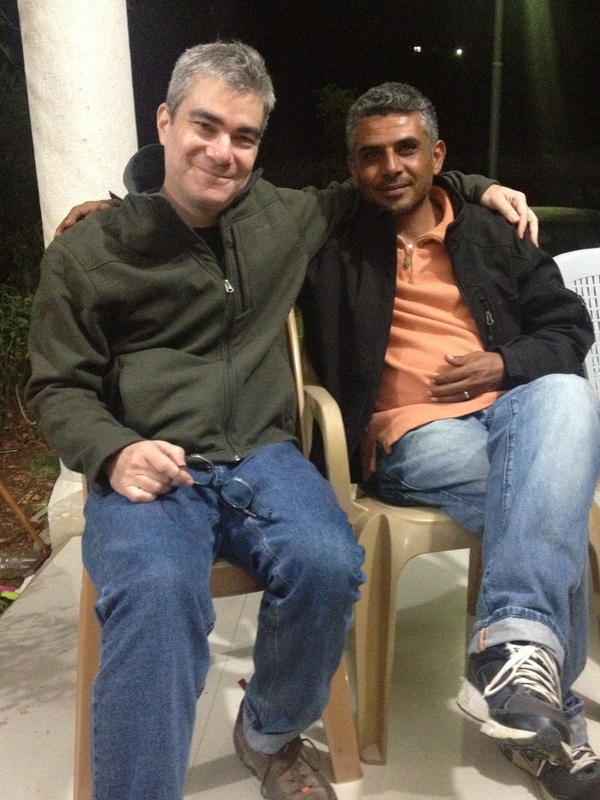 Our “home base” for the trip is Bil’in; our host is Iyad Burnat, a prominent leader in this movement. Iyad serves as the head of the Bil’in Popular Committee Against the Wall, which has led weekly demonstrations against Israel’s separation barrier for the past nine years and has been one of the leading communities in the Palestinian popular resistance. I’ve written a great deal about Bil’in over the years and I’ve closely followed the news out of this small but mighty West Bank village. And like many, I was transfixed by the Oscar nominated documentary, “5 Broken Cameras,” directed by Iyad’s brother Emad, which movingly documented Bil’in’s ongoing struggle. 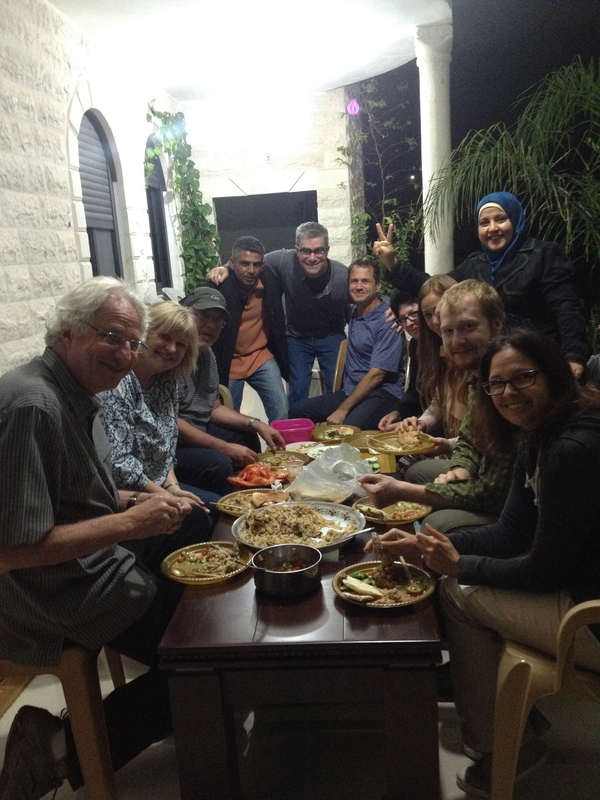 Our hosts here have been gracious and wonderful – Iyad (in the orange shirt, top pic) and his wife Tasaheel (in the blue hijab) and his cousin Mustafa and his wife Sabrin have joyfully welcomed us into their homes and their families. This is clearly much more than a chance to learn about a movement – it is an opportunity to share in a way of life, to forge new relationships, to make dear new friends. And yet the struggle continues: the wall continues to choke off the people of Bil’in from their livelihood and the occupation continues to take a major toll on the life of the village. Our group will be participating the demonstration at the wall at Bil’in’s weekly demonstration this Friday – at which time similar demonstrations will take place in villages across the West Bank. This act of solidarity will be, without question, the most important aspect of our itinerary. One of the newest additions to the village is a new garden dedicated to the memory of Bassem (“Pheel”) Abu Rachme, a much beloved and very charismatic leader in Bil’in who was killed in 2009 when a tear gas canister struck him in the torso. His killing was captured on camera in “5 Broken Cameras” in one particularly heart-rending moment. Bassem’s memorial garden (above) lies in the land that was recently reclaimed from the relocation of the wall. 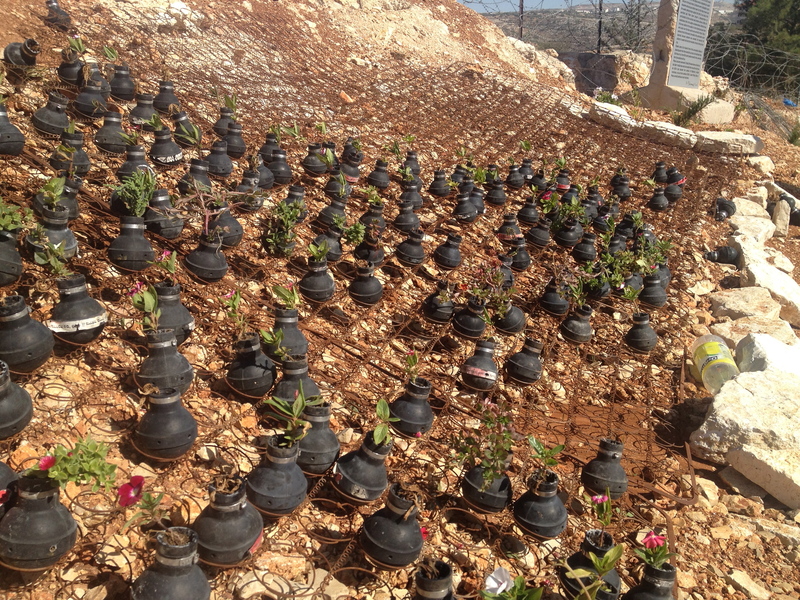 The myriad of small black planters are made of tear gas canisters. 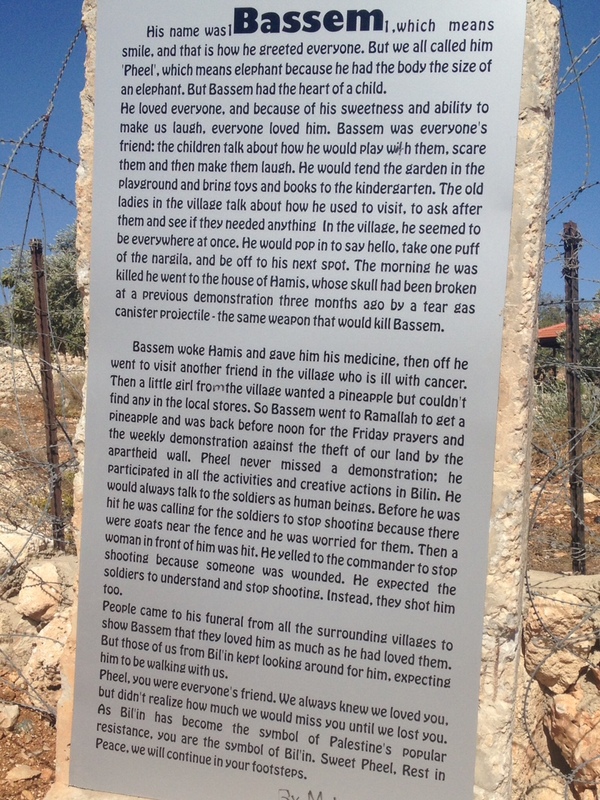 Please read the long tribute from the plaque at the garden, below, to get a sense of this man who will always occupy a dear place in the hearts of the villagers of Bil’in. In my next post I’ll write about our memorable visit to Nabi Saleh, another prominent village involved in the Palestinian nonviolent resistance. Back soon. This entry was posted in Bil'in Solidarity Delegation 2013, Human Rights, Israel, Nonviolence, Palestine on October 21, 2013 by Rabbi Brant Rosen. Enjoy the beauty of the land and the people, and work and witness for peace! Since being there 7 years ago with Interfaith Peacebuilders, a part of my heart has stayed in both Israel and Palestine. Peace, Salaam, Shalom! Brant and Friends, Thank you for sharing your wonderful Tikkun Olam. Thank you for your work and report. There is much good here, but I am disheartened by the reported act of the shooter of the fatal tear gas canister who put an “X” on his rifle. That he was so emboldened reflects badly on the culture of the IDF occupation forces. One also asks what if any compensation was paid to the family.